Recently, while cleaning out our old practice space, Chris and I stumbled on a bunch of old show flyers. 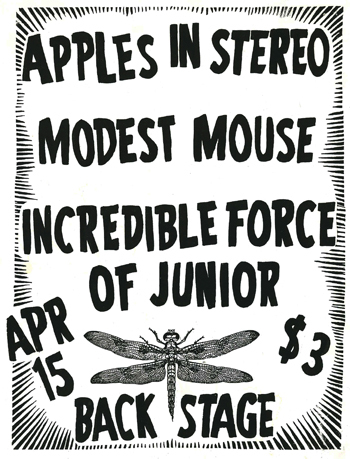 In 1996 you could have seen Chris’ pre-Tullycraft band, Incredible Force of Junior perform with Modest Mouse and Apples in Stereo for only $3. What a deal! What a show! Here is a great song by Incredible Force of Junior called Driving in Your Car. Enjoy!